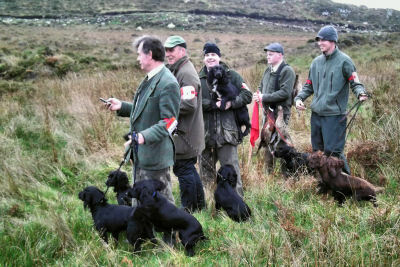 The CSCOI & DCSS Joint Health Committee (JHC) are pleased to announce a Clinic will be held at the Joint Cocker Clubs Open Show on Febuary 4th, 2012. Dr. Terry D. Grimes BVetMed DVR DVOphthal MRCVS DipECVO, appointed panellist for BVA/KC/ ISDS CHS Eye Scheme and has kindly offered to hold the Clinic on behalf of the JHC at a Special Group rate. 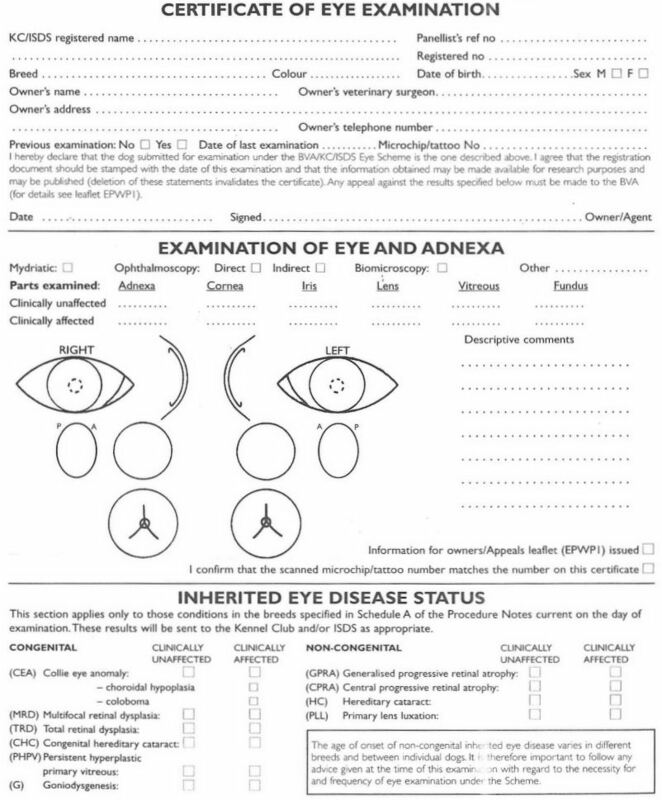 The following information is a guideline to the process, BVA Form/Report and reasons why, even if your dogs have been DNA tested for the two available Gene tested conditions why you should still consider a yearly eye examination for you dogs and also recommend the same for other Cockers owners including those members have sold puppies to. A dog is for life and requires both a duty of care and sense of responsibility from its owner. For all the love they give us, this is just a little ask in return. The Examination requires that drops be instilled in your dog's eyes which take a few minutes to work; these drops will dilate the dog's pupils allowing the examiner to have a better view of the internal eye structure. The Process including Examination should take about 30 minutes to complete. Normally a few dogs will be done in a batch and once the drops are active, each dog will be examined individually, ensuring confidentially. Of course Dogs entered in the show itself should wait until their show duties are observed or they might be ill at ease in the show ring. 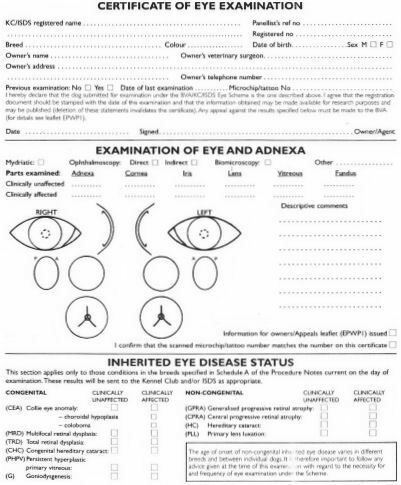 As Owner you are required to bring some items/details to the Eye Examination Clinic on the day (after booking and paying for your appointment) as set out in section 1 of the form. The following are required before the Examination can be carried out on your dog. previous Eye Examination Certificate for each dog being examined. (Microchip details on at least one of these documents). The Dog should be at least one year of age. An understanding if KC (UK) registered by owner, results will be published. 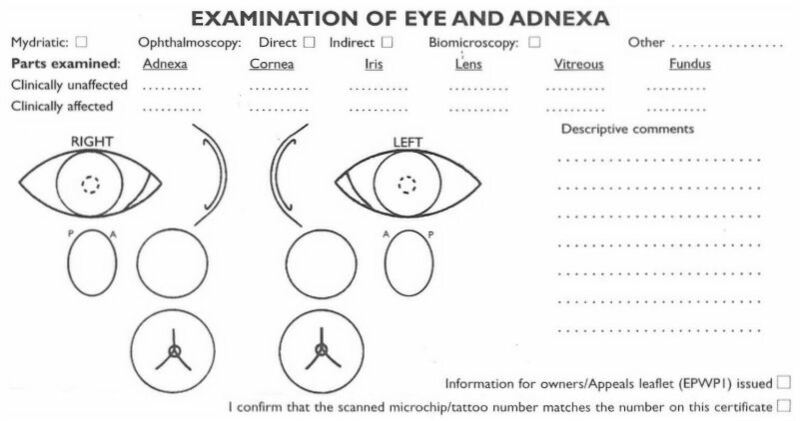 This Section details and defines the examination itself and is much the same as the checks your Optometrist carries out on you when you go for your regular two yearly eye test - (You know you should). An explanation of the terms mentioned. Mydriatic - The Drop used to dilate the eye, no drop means a much reduced view of the internal structure of the eye. Ophthalmoscopy - The process by which the examiner looks at the internal structure of the eye, may be by Indirect - Head mounted instrument and a powerful hand held lens close to the eye or Direct, a hand held instrument held close to the eye by examiner and "Other" - something like a Camera that would capture an image of the inside of the eye. Biomicroscopy - Another common instrument for eye examination, basically a microscope - since the cornea is clear we can check the cells in detail by using this, usually a hand held device in Animal practice. 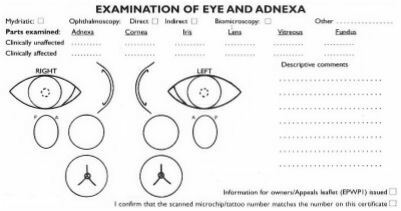 Adnexa - General Structures around the Eyes themselves, Lids, lashes, Tear Ducts, Membranes etc. Cornea - The Normally Clear window at the front of the eye. Iris - The Coloured portion of the eye. Vitreous - The Gel (Glass like liquid) that fills the "Ball" of the eye, while the liquid in the front chamber in the eye between the Cornea and Iris is called the Aqueous (or Watery) humour. Fundus - The interior surface structure of the eye, including photoreceptors, nerves, pigment and blood vessels. An explanation of the Diagrams. These allow the Examiner to document and detail anomalies found for future reference (by another examiner for example), including location, size, appearance, etc. External Eye including Adnexa, Cornea, Iris and Pupil. and frontal full view of the lens. The Fundus, Central circle indicates where the optic nerve enters the eye and then the Fundus is divided into 3 sub-sections for analysis. Appeals - The Examiner will inform you that you may appeal the results, further details from this link - BVA Appeals. Under the terms of the BVA Screening, breeds are checked for potential breed specific risks as per this link Schedule A - a list of breeds and conditions certified under the Eye Scheme. (G) - Goniodysgenesis or Primary Glaucoma diagnosis, is a further procedure which would require an addition fee and will not be carried out at the JHC Clinic, however the examiner may pick up on other indicators of this condition and will advise owners if they need to have this test carried out by their own Veterinary Surgeon. Finally the Veterinary Surgeon will advise you on the condition of your dogs' eyes and any concerns he may have. He will explain and advise on any further course of action required, which you should follow up with your own Veterinary Surgeon. If done yearly, of course there will eventually be some normal age related conditions diagnosed. It will be no different from the breeders own eyes and advice will be plenty and options discussed. Please remember, that this examination is a snapshot of your dog on the day. If all results are good, it does not mean your dog will never be affected by an Eye Disease, it just means that their eyes are okay up until this date. It is no different than when you get your own eyes tested, its function is to monitor, detect and allow detection to occur in a manner timely to enable the condition to be treated before too much damage can occur if possible. It allows Breeders to have confidence in their Stock and exhibits to potential puppy owners, that their Breeder has the best interest of the breed and their welfare in mind. This examination will cover more eye conditions than just the two commercially available DNA tests. Please bear in mind, evolution allows for the probability that, even if the genes researched are okay, other forms of Retinal Atrophy (and other eye conditions) will eventually present in the breed. Evolution allows for new variants of life forms and their diseases to appear without notice. This is why a regular eye examination is essential. A brief word on some ocular conditions. Cataract - The lens in the eye will discolour and become opaque in time, usually occurs late in life. Atrophy - Where the Retina (the nerve layer that lines the inside of the eye) degrades, think storing camera film in poor conditions where it decays and becomes damaged/useless. Usually leads to blindness. Glaucoma - Increased pressure of the Aqueous liquid within the eye, which damages the optic nerve and therefore can lead to blindness if left untreated. Entropion - A condition where the eyelids turn inward and the eyelashes rub painfully against the cornea causing damage/scarring. Ectropion - A condition where the lower eyelid turns outward. Lens Luxation - The lens within the eye slips from position. The Joint Health Committee wishes to thank Dr. Grimes and Members in advance of who intend to enter their Dogs for this Clinic. In the current climate, in which both a lack of direction and proper governance from the appointed authorities (both National and Canine) encourage the Irish puppy farming industry and the mercanaries behind them to ply their trade. As Breeders bound by ethics, we have few enough weapons to combat them. These Eye Clinics and other Health tests do incur a cost and this is reflected in the price of a pedigree pup from our members, the years of experience and dedication to the breed are taken for granted. Practical and experienced advice will always be offered freely. Members of The Cocker Spaniel Club of Ireland, Dublin Cocker Spaniel Society and The Irish Kennel Clubs are bound by a Code of Ethics. All Members puppies will be IKC registered and Microchipped. We recommend you should only purchase an IKC registered and micro chipped puppy and avoid small ads and online sales sites to combat the scourge of Puppy Farming. If the price seems to too good to be true - something is generally very wrong. Microchips will never fall out for example, however the fact they were never implanted is a common sign of a farmed pup, watch when you bring your puppy to your vet for their shots, when their eyes go upwards to heaven, be straight and ask them if you've potentially bought a farmed puppy. Research before you buy, talk to other owners of dogs from the breeder, visit the breeder at Shows etc. If the dog is just going to be a family pet please consider firstly if rehousing an animal from a shelter/rescue could equally suit your needs. 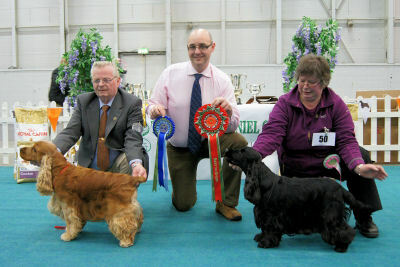 Please note: The Cocker Spaniel Club of Ireland is a not for profit a specialist breed Club. 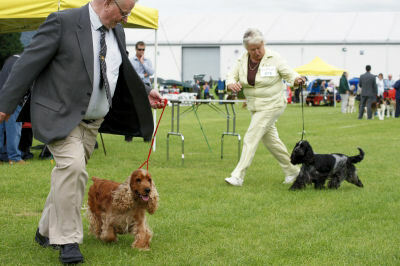 Its objectives are to promote the English Cocker Spaniel breed, to promote responsible dog ownership including keeping, welfare, breeding, selling and disposing of dogs by associate members that are accepted for registration by the Irish kennel Club and who are resident in Ireland. The Club has no commercial involvement in the sale of puppies bred by our membership.